I picked this one up and put it down several times before I eventually caved in and bought it. The cover is very beautiful, in a delicate sort of way, but the story description on the back seemed a bit too serious for my usual taste. However, when I realized that this series is by SHIMOTSUKI Kayoko, the author of Mayonaka no Ariadne and the artist for C-Blossom I had to pick this up. This author’s works are so interesting and engrossing! This book IS serious, for the most part, but there are also many moments of absurd silliness to break up the tension. I like the unusual, mysterious, almost surreal atmosphere Shimotsuki is able to create in her works. This is a complex story that takes past relationships, past crimes, and deep secrets, and ties them to a present-day murder mystery. It begins at a high school, where an unexpected school assembly is being held in order to give the students a special announcement. One of the teachers at the school, Mogi-sensei is dead. In fact, it may be murder. Police investigators are on hand at the school to interview students about the teacher, and councilors will be provided to speak with grief-stricken students. One student who doesn’t feel particularly grief-stricken is HISANO Satomi. While all the students around her are bursting into tears at the news of Mogi-sensei’s death, she can only stand there numbly, her eyes dry. She wonders why she can’t feel as upset about this as all of her classmates. Satomi looks normal on the outside, but on the inside, she is a deep and troubled girl. She also has an imaginary friend/guide who acts as her conscience. It takes the form of a sheep (not a cute sheep, a very realistic-looking animal), and it talks to her very plainly and rudely. Satomi is the only one who can see the sheep, and while she sometimes appears to be spaced out while listening to it talk to her, she usually manages to act normally. When questioned by the police about Mogi-sensei’s death, she doesn’t have much to say, at least, not the same gushing love and loss that the other students are moaning about. Even though she is usually fairly serious, Satomi has one normal friend at school, the outgoing and rather silly Kentarou-kun. He is cute and funny, and seems to really like Satomi. However, she is usually too absorbed in her own issues to either realize his feelings, or see him as anything but a friend. But something that Kentarou has DOES catch her attention. It is a magazine with a 10 year-old photo on the cover. Seeing Satomi’s interest in the magazine, Kentarou explains that his father took the photo on the cover of the worried mother hugging her child outside of a burning apartment complex. Satomi reveals that the child in the photo is herself. Looking at the magazine photo brings back a lot of memories for Satomi, and she realizes that the neighbor boy may have killed his mother deliberately with that fire. So there are two main plots intertwining in this book. 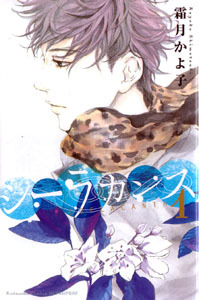 First is the investigation of Mogi-sensei’s death, and second is Satomi’s relationship with the mysterious and potentially murderous young man, and the revelation about what happened those 10 years ago. Are these events related? Is this young man a killer, and is Satomi in danger? Oh what a cliffhanger!